I have been fully aware, from my residence both in the UK and the USA, that the ordinary person in the street has very little knowledge or understanding - if any - of the history, culture and religion of either the Arabs or the Muslims. I am also sure that this ignorance is wide-spread all over the non-Muslim world. It is also a fact that most of the people who profess the Muslim faith have little comprehension of the Quran, Hadiths or Islamic history. For the last twenty three years, I have been studying and researching the subjects of the three monotheistic religions, Judaism, Christianity and Islam, exploring their roots, their inter-relationships and their historical interactions. The Quran, especially, I have studied in my native tongue Arabic, and compared and contrasted the English and Arabic translations and interpretations. My sole purpose in doing this research and enormous expenditure of time and effort - which has turned into a 'mission' - is to enlighten all those who are not followers of 'Islam' as well as all those who profess 'Islam' to make them aware of the real issues and facts based entirely on the Arabic language of the Quran, the Hadiths, the Hebrew Bible, the New Testament and Pagan Arabian religion and history. I have tried my best to put all the relevant information at the immediate attention of the readers so that they do not have to look for them in all quarters for verification. All the Quranic verses are shown exactly as they are without alterations. All the relevant references are made clear by quoting books, chapters and verses. Religion is invariably the most emotional, most volatile and most explosive subject to discuss. Belief is not subject to empirical deductions, to reality, to facts or to logic. Any true 'believer' will not question the ordinances and subjects of his/her belief. One can only accept the totality of that particular religion or not. One cannot pick and choose bits and pieces of a religion; for a true believer it is a matter of all or nothing. A Muslim theologian will find many 'explanations' as to why the Quranic stories of the Bible are markedly and sometimes absurdly different from their originals. It will not matter an iota to him that his explanations are spurious and untenable when subjected to historical and theological scrutiny. As a convinced believer, he has no choice but to accept that everything he reads in the Quran as being Allah's Truth. Just as a 'Muslim' clings to the 'truth' of his religion, then he/she should not be surprised at all, that adherents of other religions have exactly the same rights and feelings. They too are just as extremely sensitive as to how others perceive them and their religion. Since the Quran and its interpreters use unambiguous and very strong language in attacking and denigrating the People of the Book - as well as all other unbelievers - it is therefore not unreasonable to expect a maligned religion and its adherents to defend themselves and prove otherwise. There are of course many enlightened 'Muslims' in the world, but, unfortunately, the majority of them have little knowledge of the subject matter, and if they do know, are threatened with death if they contradict the majority. There are estimated over one billion 'Muslims' in the world today, most of whom do not understand the Arabic language or know much about Arab and Islamic histories. Since the Quran is written with a high standard of the Arabic language - which is difficult even for Arabic speaking people to fully comprehend - it is hence almost impossible to have it understood clearly by those who do not know the language. People in Pakistan, Indonesia, Iran, Malaysia, Afghanistan, Bangladesh, Tajikistan, Uzbekistan, for instance, although they profess to be fervent 'Muslims', in reality do not know more than the invariably one sided explanations, misrepresentations and misinterpretations perpetrated upon them by their religious leaders (Ulama). The author Salman Rushdie, for example, was sentenced to death by an Iranian - a Persian and not an Arabic speaking - religious court, which misrepresented his views on the Quran. On many occasions, TV screens show the hate-filled and contorted faces of 'Muslim' fundamentalists and their supporters screaming for Jihad (Holy War) and death and destruction not only for the USA but also for all Christians, Jews, Buddhists, Hindus, Animists, Atheists etc. to name just a few. 'Muslims' are the only 'religious' group who demonstrate their anger and hate for all Unbelieving Infidels/Kuffar, by carrying their holy book, the Quran in one hand, and guns, grenades or swords with the other. These manifestations are only the symptoms of a disease. To cure or combat the disease, one must find its source, its characteristics and its evolution. To comprehend - not to excuse - the reasons for such insane and irrational behaviour, and such intense hatred, one has to learn and understand the background of the people concerned: their core beliefs; their understanding of their theology and their history. In the last twenty years, Islamic fundamentalism has grown enormously more powerful. It has spread its tentacles and terrorist cells not only to none Muslim countries, but has also become a serious threat to the stability and freedoms of many Muslim states from Algeria to Uzbekistan. They have methodically and insidiously used the mosques and the religious education of their children to spread their CULT of hate. Already there are several 'Muslim' states controlled by despotic theocracies such as Iran, Sudan and Afghanistan to name but a few. Human rights and freedoms in these countries have no existence or relevance, since the 'religious' rulers have arrogated to themselves the sole right to act 'In The Name of ALLAH'. In these countries, more than half the population - all women - are oppressed, disfranchised, marginalized and their human rights trampled upon. They are treated more like Domestic Animals than Dignified Human Beings. The same 'Muslim' and Arab peoples, contrary to reality and facts, blame their misfortunes and poverty on the West and Others instead of on their mostly corrupt leaders and unconstitutional governments. Putting it in the most basic and elemental context, the 'engine' that drives their apocalyptic rage is jealousy, envy, spite & ignorance. This may sound very simplistic; so be it, since nothing else can explain their disturbed mental condition. They are jealous and envious of the success of many none Muslim countries - especially the Christian West and Israel. They hark back to the centuries when 'Islam' was the dominant imperialist power on earth and find it extremely difficult to comprehend or accept the facts of life that while their power has ebbed away and diminished through their own faults, the West and Others - invariably democratic governments - have excelled and flourished because of their liberal and egalitarian societies. It is always easier for people to blame someone else for their own failures, with the certain but dire consequences that they will never be able to rectify their situation unless and until they face facts and reality. Without democratising and liberalising the Muslim peoples' systems of authoritarian and unrepresentative governments and making them accountable, they will never be able to get out from their miserable circumstances and share the wealth that the world economies can offer. "The greatest threat to the civilized world in the 21st century is not nuclear weapons, but most assuredly Fundamentalist Muhammadan Islam, with or without weapons of mass destruction. They believe and state clearly and unambiguously, that the whole world must be converted to their version of Islam and that no other religion should exist." It is possible that the above statements will encounter a lot of disbelief and outrage among some people. Some may consider them 'racist' or 'extremist'. The contents of this thesis aim to show beyond a reasonable doubt, that these statements are not only factual but also true, as they are based entirely on the words of Muhammad and his followers. In the name of God -any god- millions of people have been killed, murdered and/ or exterminated. In reality, the gods that have been invoked had nothing whatsoever to do with the actions of the humans who were using/abusing their names. That is, the consolidation of power through fear and the acquisition of wealth in all its manifestations. I have endeavoured to compile this thesis in a concise manner without compromising my objectives. My intention is to give the reader a panorama of the subject without delving into unnecessary details. I have done my best to put before the reader the history and our understanding of the traditions of the Arabs before Islam. This is followed by a brief history of the Arabs and the rise of Islam until the death of Muhammad. Before exploring the history of the Arabs after Islam and their conquests, I have endeavoured to elucidate the background and genesis of the Quran, since it was - and still is - the propellant that ignited and sustained their belief in their theological supremacy over all others, thus leading to their conquests and expansion. I have concentrated on what in my opinion are its most relevant chapters and verses and have compared and contrasted the Biblical, Scriptural and pagan Arabian religious narratives mentioned therein with their original versions, showing innumerable instances where the Quranic stories deviate substantially from them in form and content. The final section describes the Arab and 'Muslim' conquests, concentrating on the most important personalities and events. The dynasties of Arab and Muslim rulers are plotted, but only the most prominent leaders are elaborated upon in detail. Maps, genealogies and family trees are supplied so as to keep the stories connected and in focus. Copious definitions of Arabic words and expressions are supplied in as comprehensive a glossary of 'Definitions' as possible. The objective is to enlighten the reader under one 'roof' without overwhelming him with unimportant information. This thesis has been made freely accessible to all because its only purpose is to inform and challenge the intellect of its readers. Any and all those who doubt anything within, can confirm or refute any of the information contained therein by using the internet, which holds more instant information than ever in the history of mankind. All the author asks the reader to do is to use his/her God-given intelligence to evaluate, compare, contrast, research and investigate, arriving at their own conclusion. Finally, the author is solely responsible for all the contents of this thesis, having had no recourse to any outside advisors, editors or publishers. Since the September 11th attacks by 'Muslim' terrorists against the USA, the world media and books have inundated the public with information, misinformation and disinformation about Islam. 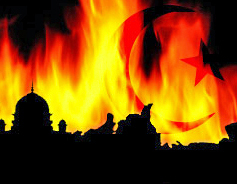 Politicians and theologians keep repeating the mantra that Islam is a religion of 'peace', when the history of Muhammadan Islam is written with the blood of conquests and subjugation of tens of millions of nations in at least twenty-five countries spanning three continents - Asia, Africa and Europe - stretching from India and China in the east to the Atlantic in the west. The subject peoples of these lands - who had their own religions and beliefs - did not voluntarily become 'Muslims' through dialogue and spiritual enlightenment. I have had to wait until now, (6th May 2006), to put my thesis on line since no one was willing - because of fear of retaliation - to consider printing it into a book. In-spite of the dangers involved in exposing many facts that most would not dare mention, I have decided to take the risk of making my research public and available to those who seek facts and the truth. PS: I have used the term Muslim in this Introduction so as not to confuse the reader at this stage. In my thesis, the term Muslim has been replaced by the more factual and accurate MUHAMMADAN MUSLIM. www.youtube.com/AhmadsQuran3 (this has been unilaterally suspended by You Tube on 9/6/2010 due to Flagging by 'muslims').